If you own a car, you will probably also need a good entrainment system for it so that you can enjoy a long trip to different places and areas you are going. For this purpose, there are two basic radio systems available in the market. One is called single Din head unit and other is called double Din head unit. 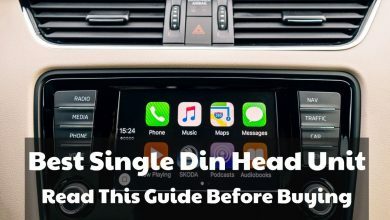 This article will explain in detail about “Single Din vs Double Din” and I have also added a dedicated Din Size Chart that explains single din and double Din dimensions. We are here to compare these two din units so that you can have a good idea about the one going to do wonders for you. We will discuss the single and double din head units in details first and then we will compare both dins with one another so that you won’t get confused about the radio units. Major differences between single din and double din include: single din requires less space and does not include a widescreen display. Double din head unit is more user-friendly and includes video playback. 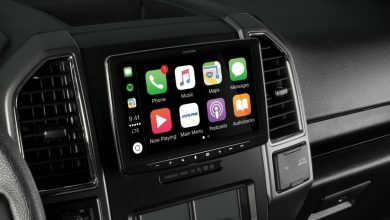 With a Double Din stereo, there are a number of connectivity options, you can use aux, iPhone, iPad, Android, mp4, USB, memory cards and many more. I always recommend going for a double din stereo, it features user-friendly features along with a video screen. DIN is a German terminology which stands for Deutsches Institut für Normung. This is basically a German standard organization that has created the original standard of car head units that we use till this day. DINS are commonly divided into two parts i.e. a single din head unit and a double dib head unit. Both the units have got their own fitting sizes and other differences. A standard din dimension as categorized by the organization should be 180mm long and 50 mm tall. Why You Need DIN unit? The answer is simple. You need a good din unit in your car to remained entertained all the times and so that you can enjoy long trips without any boring ride. A DIN unit comes with a lot of features such as radio system, USB inputs, large screen (Double DIN) and much more which offers a good way of enjoyment as you can listen to songs or radio on these units easily. It is an essential part of Best Car Stereo. Single Din head units are the units that have got small dimensions as compared to double din head units. They have normally got a dimension of 180mm length and of 50mm of tallness respectively. Most of the automakers and car stereo system comes with a space of a single din head unit. Single din head unit comes with a compact size range and it is a standard through which different din head units are prepared. I have just posted a detailed article on Best Single Din Head Unit, click here to read detailed product reviews. Single din head unit comes with a lot of features. It is the final determinant through which you can control the speakers. It has got a small screen which displays the type of music you are playing with different devices. The compact size allows you to have pretty much space for storing other accessories. Single din head units come with USB input and an AUX cable input as well. The USB input can be used to charge your cell phone easily. The aux cable makes it easy to connect the din with any portable device with a 3.5 mm jack. There are two ways to replace a single din head unit. One of the most common ways is to replace it with another aftermarket single din unit. The aftermarket single dins have got a lot more features than the factory made dins. Other way includes replacing a single din with a double din head unit. Yeah, it will take a lot of space and you won’t be able to store accessories in the space below a single din head unit but if you are willing to make a sacrifice for having an updated din unit then you can replace a single din head unit with a double din unit. Read details about Single Din vs Double Din before you make your final choice. Double din head units are larger in dimensions as compared to the single din head units. They have got dimensions of 180mm length but they are twice as tall as single din head units. The tallness of double head din unit ranges from 80mm to 100 mm respectively. Double din head units come with a lot of features and are a pure way of entertainment. With a large screen, you can easily navigate different options. You can set up and adjust different preferences of music easily. The large screen allows you to watch video songs as well. On the other hand, double din units come with volume control buttons, USB inputs and aux cable input for better compatibility. They are a lot better in terms of features and specifications. Most of the double din head units also come with Bluetooth feature which allows the car driver to connect his or her devices wirelessly. 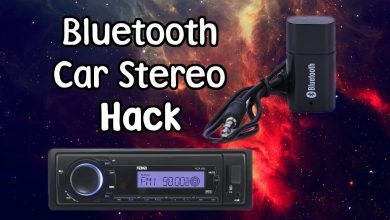 With a smartphone integration via Bluetooth in many double din headsets, you can easily access music apps like Spotify, Soundcloud, iTunes, etc. Always adjust stereo settings better sound and music. The only drawback these units have is the size issue. Although single din head units don’t offer many features as compared to double din units they have got a compact design and that’s why they can easily get adjusted in any car’s dashboard. Below I have given details about Single Din vs Double Din Headunits. Below is the Din Size Chart comparison table between a single din car stereo versus a double unite car stereo. Din Size Chart gives details about both single din and double din head units. If you are just starting, I recommend following Din size chart and you will have all the information you require. I have explained in detail about single din dimensions and Double Din Dimensions. Length in Inches 7.0" Length in Inches 7.0"
Tallness in Inches 2.0" Tallness in Inches 3.0"
I have personally used this Din Size Chart when buying a car stereo. Check it out guys, if you still have any questions, will be glad to help. I personally like to go for a double din stereo, with these unique double din dimensions, it is just a perfect suit for my car. Below is the Comparison chart of Single Din vs Double Din. In this Comparison Table for Single Din vs Double Din, I have added all the important aspects of both categories. More compact and easily fits in the dashboard Requires more space to fit. Digital screen with limited visibility Large HD video screen for different purposes. A cell phone cannot be accessed. A cell phone can be accessed easily via large screen. From the size chart listed above, it is clear the single din head units have got a very compact size as compared to the double head units. Single head din units also come with a standard dimension which means they are able to fit in a dashboard of the car. There won’t be an issue of size or space if you are going for a single din head unit. When we talk about double head units they are probably the same in length. Things get complex when we talk about the tallness of a din. Due to the inclusion of a large screen, double din units are probably taller than that of single din units. Read about if you want more bass out of your subwoofer. As a result, they will require a lot more space in the dashboard of a car. So, that’s where you will face difficulty in replacing a single din unit with that of a double head unit. Due to larger dimensions, double din units are difficult to fit in a car dashboard which has got a space for a single din unit only. Double din head units come with easier control. 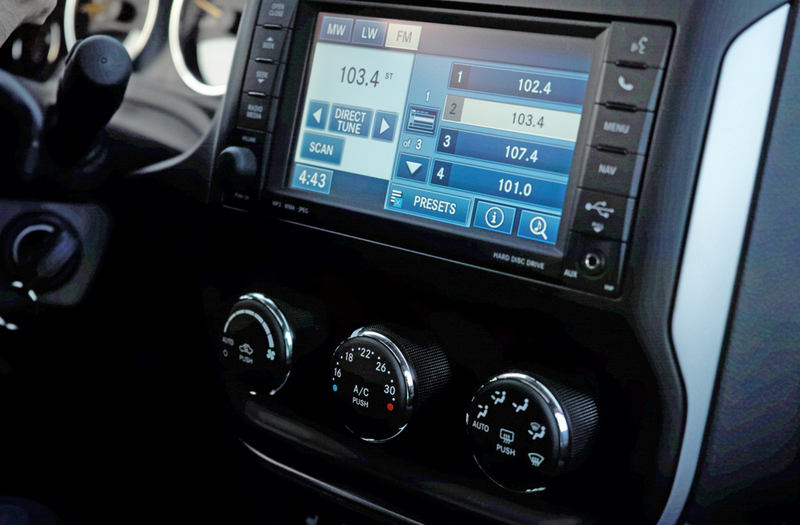 We are not saying that single head units come with complex controlling options. Double din head units take an upper hand just because of larger screen size. The larger screen size makes it easier for you to control the volume, bass, or other controls easily. On the other hand, a single din unit has a very small screen. You will face issues in controlling different options on a single din unit while you are driving. Double Din head units come with DVD players. Now we all know that single din units also comes with DVD player then what separates both units? The answer is simple. With a double Din unit, you can get access to video songs and video DVD can be played easily on them while in case of a single din unit, you cannot get access to video feature. So, with the help of a large screen, you can also watch different movies and videos via DVD player on a double Din head unit and in case you have got a single din unit, you can only hear the audio part. A video screen is what makes a prominent difference between a single din unit and a double din unit. A single Din unit doesn’t come with a video screen. Although it has got a digital screen which offers to see different options so that you can control them easily. On the other hand, a double Din head unit has got an HD video screen which allows you to watch different movies and video songs easily. You can navigate different options like volume control, bass control, treble control, and volume balance control easily. Learn here about properly mounting the subwoofer box in the trunk. With the help of a large video screen, navigation becomes easy. You can also use the screen to connect the rear camera of the car so as to park the car easily. Large video screen allows you to manage different options even when you are driving the car with fast speed. The GPS navigation system can also be accessed through a video screen which is available in a double Din head unit. So, this is where a double din head unit has got an upper hand against a single head unit. Single din unit has got a limited connectivity option. You can only connect your devices via a USB port or an AUX port. There is no other way to connect your gadget like a cell phone or mp3 player with a single din unit. This is not the case with a double din unit. A double din head unit has got an advanced connectivity feature. With the help of Bluetooth, you can now convert the screen easily into your smartphone. This is one of the best features till now because in some countries it is not allowed to use a smartphone while driving and if you connect the din’s video screen with a smartphone it will work just like a smartphone and you can easily access the video screen as compared to the cell phone. Read this guide on car door speakers. So, in terms of connectivity, a double din head unit leaves single din far behind as it has got some advanced connectivity systems. Single Din vs Double Din head units details can be read below. Well, this was a small comparison article about a single din head unit vs double din head unit. With the difference table, it is clear that double din units have clearly got a lot more features than that of single din head units. I recommend going for a double din car stereo, it comes with lots of user-friendly features and with a video screen. Check out Din Size Chart for a better understanding of car stereo sizes that explains the single din dimensions and double Din dimensions. The single head unit is only compact and that’s where they have got an upper hand against a double din head unit. I hope I have cleared the differences between Single Din vs Double Din. Din Size Chart will explain everything in detail about stereo head units. So, if you have got enough space to fit a double din head unit, go for it and you will not regret your decision ever. Well, if you have got less space in the dashboard, a single din head unit will be a suitable option for you in this regard. I have explained here, subwoofer size chart along with features and specifications of different car subwoofers.